In an effort to conceal an ongoing RICO-like criminal conspiracy inside City Hall , the City of San Antonio, Texas has been violating the Securities Exchange Act and other laws for many, many years. Specifically, the City of San Antonio made fraudulent material misrepresentations and omissions regarding its financial condition to municipal bond purchasers , underwriters, banks and the investing public. 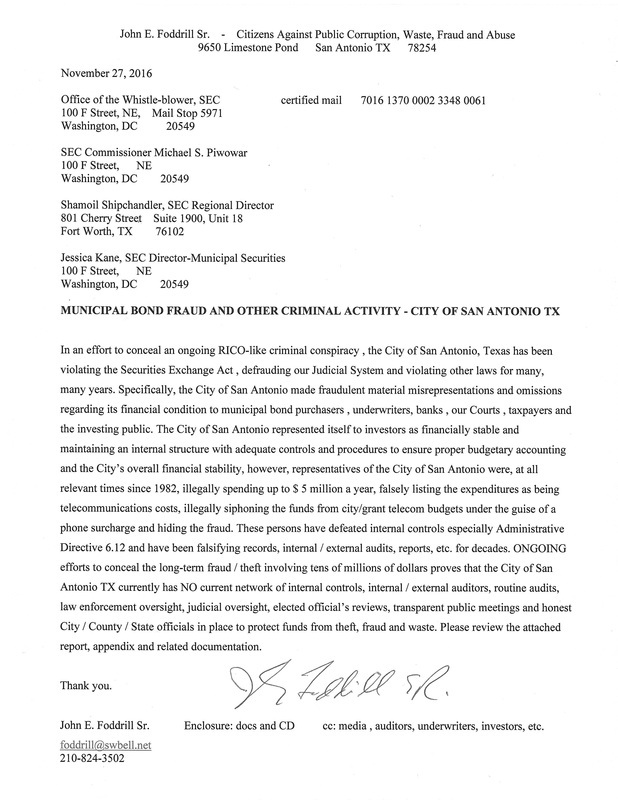 The City of San Antonio represented itself to investors as financially stable and maintaining an internal structure with adequate controls and procedures to ensure proper budgetary accounting and the City’s overall financial stability, however, representatives of the City of San Antonio were, at all relevant times, illegally spending up to $ 5 million a year, falsely listing the expenditures as being telecommunications costs, illegally siphoning the funds from city/grant telecom budgets under the guise of a phone surcharge and hiding the fraud. These persons have defeated internal controls especially Administrative Directive 6.12 and have been falsifying records, internal / external audits, reports, etc. for decades. 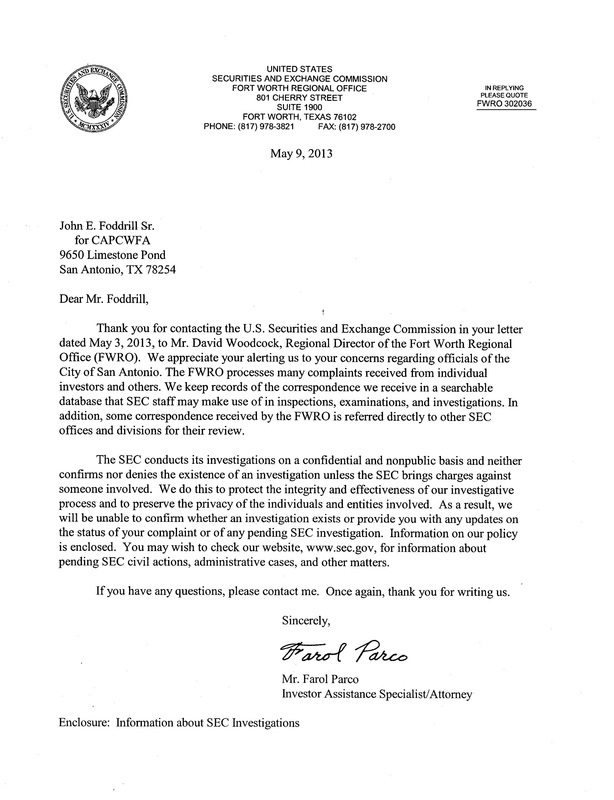 ONGOING efforts to conceal the long-term fraud / theft involving tens of millions of dollars proves that the City of San Antonio TX currently has NO current network of internal controls, internal / external auditors, routine audits, law enforcement oversight, judicial oversight, elected official’s reviews, transparent public meetings and honest City / County / State officials in place to protect funds from theft, fraud and waste. The ONGOING criminal conspiracy to conceal the fraud/theft adds additional criminal charges to the list of illegal acts. Rather then expose the criminal activity , correct the record and return the stolen / misused funds, City officials have been committing the crimes of aggravated perjury, subornation of perjury, obstruction, conspiracy, fraud , falsification of government documents, Judicial Fraud, open meetings violations , official oppression, etc. in an effort to cover up the fraud. With proof of the long-term fraud in hand and with the illegal cover-up in full swing they published official statements declaring that complaints were “unfounded” , that controls were in place safeguarding city assets and that all funds were safe. In reality, funding was spent outside a voter mandate passed in the form of annual budget ordinances, grants and bonds that by law set aside money for telecommunications and E911 support. Funding was spent in violation of local government codes, competitive bidding regulations and other laws and was at times used to support criminal schemes to funnel money outside the City behind the backs of Council and citizens. Since 1982 auditors did not perform anything remotely resembling an audit of the “variable” telephone billing account or attempt to learn how up to $ 5 million a year was actually spent by applying generally accepted accounting principles and standards. City finance and budget officials admit that they didn’t understand the “variable” and didn’t trust fiscal reports submitted by the IT Department but looked away instead of alerting auditors, halting the illegal activity, exposing the cover-up and taking the necessary steps to ensure the integrity of City fiscal records. In 2005 when proof of the criminal activity was being uncovered by the City’s new Telecommunications Manager and the Office Of Municipal Integrity, rather than expose the fraud and hold the dishonest employees accountable City officials ( City Manager Sheryl Sculley, City Attorney Michael Bernard, Police Chief William McManus, City Auditor Kevin Barthold, City Chief Information Officers Michael Armstrong / Richard Varn, Mayors, Councilpersons, etc.) chose to conceal numerous reports of wrongdoing and embark on an illegal scheme to hide the criminal activity , to shut down an internal investigation, to block a criminal investigation, to violate the Texas Open Meetings Act for almost four years, to finance frauds upon our judicial system with tax dollars ( Bexar County 57th District Court and Federal Court) , to falsify government documents , to defame the City’s Telecommunications Manager, to cover up hundreds of cases of mail/wire fraud , to cover up the theft of $200,000 by City IT manager Jose Medina and vendor Isabel Gonzaba ( IG Communications) and to violate the law and numerous regulations / rules in the process. Over the years numerous persons have violated the law in an effort to conceal the criminal conspiracy. In 2009, FBI Agent D. True Brown published a fraudulent statement in an effort to conceal the criminal conspiracy while the FBI , DOJ , HUD, SEC, etc. stall and play along with the illegal cover-up and protect high-level politicians stretching from South Texas to the White House. City auditor Kevin Barthold , external auditor Padgett, Stratemann & Co. and others have ignored proof of the theft/fraud for years. Sadly, the San Antonio Express News , KENS, KABB, WOAI, KSAT, TPR and other local media organizations help cover up the criminal activity to protect corrupt officials. The illegal acts of many participants in the ongoing RICO-like criminal cover-up have been or soon will be exposed in separate reports. Official statements from 2007 to present day are attached to this report and present an overview of the fraud. Official statements, financial reports and other documentation included in municipal bond offerings from September 2006 to November 2006 fail to mention a pending lawsuit “ John Foddrill v City of San Antonio” , omit any mention concerning the “misuse of funds” and contain numerous statements attesting to the success of internal/external controls in securing the safety of all funds. In November 2007 numerous bond offerings contain documentation listing the lawsuit “ John Foddrill v City of San Antonio” . The documents cite reports of “misuse of funds” while offering the same assurances that all funds are safe from theft, fraud and waste. In June 2008 city officials suddenly include information calling the reports of “misuse of funds” as “ unfounded” and include documentation offering the same assurances that all funds are safe. City officials possessed evidence, testimony, documentation, etc. proving that the reports of “misuse of funds” were NOT unfounded and that funds were NOT safe as tens of millions of dollars had been secretly, illegally siphoned from city and grant budgets for decades. City officials included these false statements in the official statement while omitting information detailing the theft and misuse of tens of millions of dollars via the internal telephone “ variable” billing account and the City’s Avaya Telephone Contract since 1982. From July 2008 to December 2008 City officials continued to publish information calling the reports of “misuse of funds” as “unfounded” while making assurances that all funds were safe. City officials made these false statements while they possessed PROOF that tens of millions of dollars were stolen and / or misused for decades after internal / external controls failed. In February 2009 the lawsuit “ Foddrill v City of San Antonio” was heard in the Bexar County 57th District Court of Judge Antonia Arteaga concerning the fact that the City’s Telecommunications Manager was fired for refusing to go along with the criminal cover-up. The law firm of Fitzpatrick & Kosanovich was paid upwards of $56,800 to defraud our Judicial System and conceal the criminal cover-up. ALL attorneys in the courtroom ( including Malinda Gaul representing the City’s former Telecommunications Manager) , City CIO Richard Varn , Management and Budget Director Peter Zanoni , Texas Ranger Capt. Hank Whitman , City IT Director Hugh Miller and others conspired to conceal material evidence and defraud the court with known false testimony to conceal the criminal cover-up. ALL attorneys and others made it appear that it was perfectly legal to secretly siphon up to $5 million a year since 1982 from City and grant budgets ( many tens of millions of dollars), spend the money on anything they wanted including criminal schemes involving the City’s Avaya Telephone Contract, spend the money without Finance Dept. approval or knowledge , spend the money with no public hearing /Council approval / City ordinance and to write the expenditures off as “telephone costs”….ALL LIES. The testimony that Chief Information Officer Richard Varn and others presented in the Bexar County Courthouse in February 2009 was a fabrication concocted by City Attorney Deborah Klein , City Attorney Michael Bernard, IT Director Hugh Miller, the law firm of Fitzpatrick & Kosanovich and others. Klein coached Varn , Texas Ranger Captain Hank Whitman and other City witnesses during their presentation of known false testimony while the opposing attorney Malinda Gaul sat idly by. Attorney Malinda Gaul and Municipal Integrity Manager Virginia Quinn helped hide the criminal activity from the Court while their husbands - Grant Gaul and Mike Quinn- helped conceal the criminal activity as Alamo Area Council of Governments - AACOG Directors while hundreds of millions of dollars flowed from AACOG to the City. Attorney Malinda Gaul knew the testimony was entirely false but raised no objections and refused to enter Varn’s 2007 deposition, Administrative Directives 6.12, 1.6, 2.1, 2.2 and other documents into evidence. Gaul listened to Texas Ranger Whitman state under oath that there was no wrongdoing found to investigate BUT she and Whitman knew that Asst. DA Barry Elliott had after a meeting with Whitman and Foddrill obtained a search warrant for the bank records of City IT Manager Jose Medina , knew of the falsification of government documents by IT Manager Diana Gonzalez and others, knew of the no-bid contracts steered to friends, knew of the illegal use of the “variable / City Avaya Contract and knew of the theft of upwards of $200,000 by Medina and city vendor Isabel Gonzaba. Both Whitman and Gaul hid this and other information from the Court. Gaul knew that Texas Ranger Whitman was concealing the fact that he had vowed to collect additional proof of aggravated perjury having seen how IT Director Miller and IT Manager Gonzalez has altered time reports associated with the Hurricane Katrina Evacuation Project. Gaul refused to file a motion for a new trial, refused to call for an evidentiary hearing to expose the aggravated perjury and refused to file an appeal. Gaul has helped conceal the fraud upon the court and materiel evidence for eight years. Attorneys Klein , Kosanovich and Gaul were present at Varn’s 2007 deposition when he stated “ I don’t know what that is” when asked about the “variable” and they also had knowledge of City documents proving Varn and others to be lying under oath about the legal use of the “variable” (especially AD 6.12) but allowed the fraud upon the court to continue and allowed Varn to falsely testify that he knew about the “variable”, investigated the billing account and found nothing wrong…ALL LIES. The jury was never allowed to know of Varn’s 2007 deposition , AD 6.12 , the search warrant for City IT Manager Jose Medina's bank records , the theft of $200,000 or the City, State and Federal documents that directly contradicted his and other fraudulent/fabricated courtroom testimony. The attorneys, Varn , IT Director Miller , Texas Ranger Capt. Whitman and others presented a fraud upon the court. Attorney Klein also lied during a hearing concerning a motion for a new trial when she stated that no managers had been deposed thus concealing the deposition of City CIO Richard Varn once again while stating that there was no perjury. Judge Antonia Arteaga denied the motion, refused to hold an evidentiary hearing and for the past eight years has concealed material evidence , the fraud upon the court , Varn’s deposition, AD 6.12 and the underlying criminal cover-up. Attorney Kathleen Cassidy Goodman was paid to appeal the verdict obtained via fraud BUT was coerced by attorney Edward Pina to help conceal the perjury and other aspects of the ongoing criminal cover-up. In 2015 the New Mexico DOJ investigated corruption inside the Bexar County Courthouse but prosecuted only two minor cases while the local FBI and DOJ allowed the criminal cover-up to continue while proof of the illegal activity mounted. On July 1, 2009 an illegal, unconstitutional criminal trespass warning barring entry by the City’s former Telecommunications Manager into City Hall and public meetings was issued by City Attorney Michael Bernard and SAPD Chief William McManus in an effort to conceal the ongoing RICO-like criminal conspiracy. No reason for the ban was provided , no time limit was provided and no due process appeal was provided. The illegal, unconstitutional ban was issued shortly after the City’s former Telecommunications Manager and his wife presented proof of the criminal cover-up to City officials ( especially Councilpersons Ray Lopez and Cris Medina) and scheduled meetings to review the evidence. Bernard and McManus ( with the assistance of Councilman Ray Lopez) confiscated evidence of the criminal cover-up, tore up police reports and swore everyone to secrecy in an effort to conceal the ongoing illegal cover-up. The ban lasted almost four years while City officials held illegal meetings in violation of the Texas Open Meeting Act and other laws. Bexar County DAs Susan Reed and Nico LaHood refused to enforce the TOMA so as to protect their friends and conceal the criminal activity. Attorney Edward Pina was paid to expose and remove the illegal ban BUT played along with the criminal cover-up and actually in August 2011 helped Texas Civil Rights Project attorney James Harrington and others write a “white-paper” report praising SAPD Chief William McManus while omitting any mention of the illegal, unconstitutional ban and ongoing criminal cover-up. From July 14, 2009 to October 15, 2012 Assistant City Manager Peter Zanoni, City Attorney Michael Bernard, CIO Richard Varn , Councilman Diego Bernal, Mayor Julian Castro, Councilman Ray Lopez, Councilman Soules, City Manager Sculley , City Auditor Kevin Barthold and others approved bond offerings knowing of the fraud upon the court , the illegal ban, years of illegal meetings and other criminal acts committed to conceal decades of fraud and theft from underwriters, banks and investors. From May 15, 2013 to April 8, 2014 City officials including Assistant City Manager Peter Zanoni, City Attorney Michael Bernard, city auditor Kevin Barthold , San Antonio Water System - SAWS CEO Puente , City Public Service - CPS CEO Beneby, Councilpersons Gonzalez / Saldana / Viagran / Lopez / Medina / Nirenberg , Mayor Castro , City Manager Sheryl Sculley and others approved bond offerings knowing of the ongoing criminal cover-up . The official statements omit any mention of TWO Federal Civil Rights / Free Speech / Freedom of Assembly lawsuits filed against the City, City Attorney Bernard and SAPD Chief McManus for banning two law-abiding citizens from City Hall and public meetings to silence their reports of corruption. Lawsuit 5:13-cv-00051 was filed on February 26, 2013 by the City’s former Telecommunications Manager - John E Foddrill Sr. And Lawsuit 5:13-cv-00091 was filed by former SAFD analyst Michael Cuellar on February 11, 2013. The official statements omit any mention of Federal Judge Xavier Rodriguez overturning the City’s illegal, unconstitutional bans on March 28, 2013 after City officials held almost four years of illegal meetings in violation of the Texas Open Meeting Act and other laws/regulations. The official statements omit any reference to the $90,000 settlement awarded Michael Cuellar in case 5:13-cv-00091 in February 2014. The offerings conceal the facts that the law firm of Fitzpatrick & Kosanovich was gain paid to defraud our Judicial System and that (via attorney Shawn Fitzpatrick ) SAPD Chief McManus, city attorney Bernard and the City ( represented by Mayor Julian Castro) presented false statements to the Court declaring that there was no perjury in the 57th District Court and is no conspiracy in an effort to conceal decades of fraud / theft. Sadly, Federal Judge Xavier Rodriguez played along with the fraud upon his court as he had been involved in a business deal to obtain a site for the new federal courthouse from the City of San Antonio. Judge Rodriguez kept the business deal secret and refused to recuse himself while he heard the Free Speech lawsuit naming his business partners as defendants. Judge Rodriguez suddenly reversed his own ruling and dismissed the lawsuit due to statute of limitations while helping conceal the underlying criminal cover-up and fraud upon his court. The illegal transfer of land and funds on October 14, 2010 during an illegal city council meeting closed to whistle-blowers in violation of the Texas Open Meeting Act provided Judge Rodriguez with a building site and he kept the illegal deal intact with his new ruling. Attorneys Joseph Hoelscher and Dan Moore were hired to represent the City’s former Telecommunications Manager after Judge Rodriguez instructed him to obtain legal counsel. Hoelscher and Moore lied when they stated that they were working on a motion for an evidentiary hearing to expose the ongoing criminal conspiracy and the lies told by McManus, Bernard and the City to the Court ( there was no perjury and there is no conspiracy). They lied when they stated that they were amending the lawsuit to include charges of defamation concerning the libelous/slanderous statements made by City Attorney Michael Bernard on Texas Public Radio in early 2013 when he stated that bloodshed was a possibility and that Foddrill and Cuellar were real threats. Hoelscher has since made public statements defaming his own client in an effort to conceal his involvement in the ongoing criminal conspiracy. Bexar County Sheriff Susan Pamerleau and her staff refused to expose the criminal activity and enforce the law . During 2015 and 2016 while City officials submitted official statements ensuring that safeguards and controls were in place to protect funds, Bexar County District Attorney Nico LaHood conspired with City / County officials , Judges, attorneys and law enforcement to conceal the ongoing criminal conspiracy, to conceal almost four years of illegal meetings violating the Texas Open Meeting Act in an effort to protect former Mayor / HUD Secretary Julian Castro , attorney Michael Bernard ( brother of White House Social Secretary Jeremy Bernard) and others from prosecution. LaHood lied in an official publication on November 19, 2015 stating that he had no documents while the US Postal Service provided proof that LaHood had received at lest five certified letters detailing the TOMA violations and the underlying criminal cover-up. The SA Express News published an article on June, 16 2016 detailing the on-line cyber-bullying attacks by LaHood targeting whistle-blowers in an effort to silence their reports of the corruption but refused to expose the ongoing criminal conspiracy. The cover-up continues while DA LaHood refuses to enforce the Texas Open Meeting Act and other laws. Almost four years of City business is null / void per the law BUT City officials are concealing this and other important , material facts from underwriters, banks and investors. Throughout 2014, 2015 and 2016 ( November 18, 2014, July 15, 2015 and August 2, 2106 offerings serving as examples) knowing of the ONGOING criminal cover-up City officials including Councilman Joe Krier continued to submit known fraudulent official statements with bond offerings stating that internal / external controls, the Office of Municipal Intercity, SAPD , internal / external audits and other safeguards are protecting funds from theft, fraud and waste….a LIE. An appendix containing municipal bond offering statements, court documents , illegal, unconstitutional criminal trespass warnings and other documents is attached . A CD contains additional files and this report.